For the first time in four months, the Hagerty Market Rating posted a “sizable increase,” according to the classic car insurance and valuation-tracking company. For the first time in four months, the Hagerty Market Rating posted a “sizable increase,” according to the classic car insurance and valuation-tracking company. The July rating of 69.07 is 0.17 points better than the final figure for June. According to the monthly Hagerty pulse of the marketplace, auction activity posted a 2 percent boost in the volume of cars sold and a 1.8 percent increase in the average price of those sale. Of note, the release said, 1948-53 Cadillac Series 62 cars have shown a 93 percent jump in sales prices in the last 12 months, while 1962-76 Dodge Darts experienced a 53 percent bump in price over the same period. In addition to the Series 62 Caddys, 1979-85 Eldorado prices have increased 45 percent in the last year. Also showing renewed life were private sales, and after three consecutive months of decline. Hagerty said the boost in private sales can be traced in large part to an increase in the number of cars selling for more than their insured values. Examples included 1969-73 Porsche 911s, up 62 percent in 12 months; 1967-70 Mercury Cougars, up 45 percent during the same period; and 1982-91 Porsche 944s, which are selling for more than 28 percent above what they were a year ago. However, requests for insured value increases for broad market vehicles fell for the 10th month in a row and are at a 26-month low. Also insured value increases for high-end vehicles also decreased for the third month in a row and to a 17-month low, the insurer reported. Of six examples offered, three were Porsche 911s, with 1964-68 cars off 48 percent, 1969-73 cars down 33 percent and 1994-1998 models down 27 percent in the last year. Also dragging down the numbers were such “correlated instruments” as a boost in the price of gold. 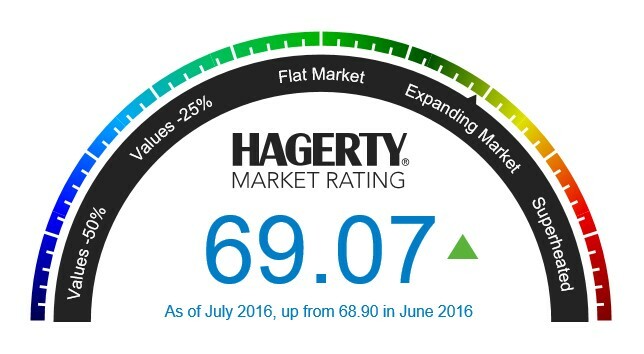 Hagerty shares its ratings midway through each month. That means the results of the auctions taking place in the middle of August on the Monterey Peninsula won’t register on the index until the September report. However, the uptick in the July figure and the strength of the various catalogs for the Monterey sales would seem a source for optimism for those buying and selling.